After graduating from UCLA, David Carter was drafted by the Arizona Cardinals. Three years later, he was released by the Dallas Cowboys and it was at this time that he started his Health Hero journey. He began to look for answers on the best ways to heal his ailing body. David had become tired of needing the painkillers as well as the blood pressure and anti-inflammatory pills that made him feel ill. After watching the documentary “Forks Over Knives”, he made the decision to step away from meats and begin a vegan lifestyle. David felt it was necessary to go to a plant-based diet because of the toll sports had taken on his body. While researching he discovered how the consumption of animal products creates inflammation in the body. 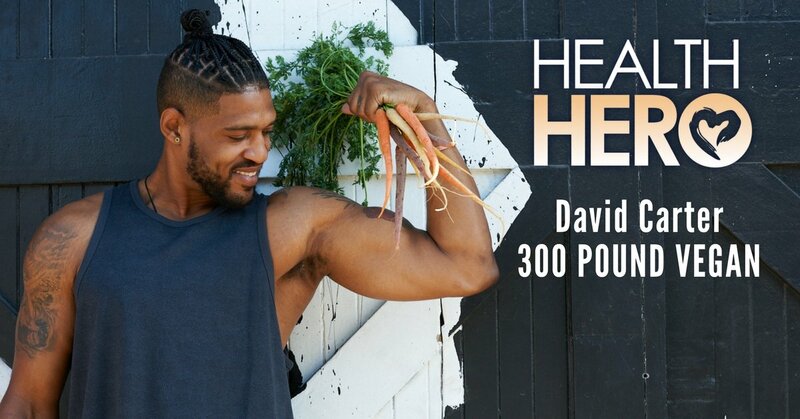 Many were worried that he would lose weight and strength due to his new diet but he has maintained his weight and strength thus earning the name the “300 Pound Vegan”. David has dedicated his life to becoming a voice for animals, the earth and human health. He is a passionate public speaker, filmmaker and works with numerous non-profit organizations to promote the plant-based lifestyle to areas that are underserved. If you’d like to read more about David’s personal story, we’ve highlighted him in our Health Hero Magazine.